Shuttle or Finger tat any red and green thread. Make 3 consecutive Josephine Rings 12 half stitches with Red thread. I work my Josephine Rings using the second half of the double stitch. Bring the thread ends together and holding the berries in your pinch and wrap the red thread ends along with a green thread end around your hand. Make 1 larks head knot over all 3 threads and a small picot then 3 more larks head knots , drop the red thread ends and continue. Snug larks head chains well. 1 DS leaving a small picot showing like a bump, followed by 3 larks head knots, repeat until you have 5 points from the small picots and join the last larks head chain to the first small picot at the beginning of the larks head chain. 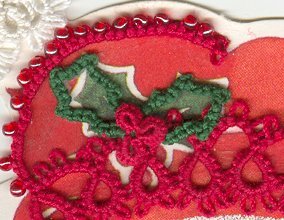 Note: Clip your Red threads close to the tatting and hide the knot from the green under the tatting where you glue it down. please email Bina or visit the S-Chain vs Z-Chain Lesson.